Simonis Cloth starts with very fine combed wool yarn. This long-fiber wool is then tightly-twisted and woven (the worsted wool process) into cloth. Then it is specially sheared perfectly flat and finally finished in a tradition of craftsmanship that our mill in Verviers, Belgium, pioneered and has refined for over three centuries. The result is a beautiful precision cloth that achieves the smoothest, most accurate and most consistent play surface available. 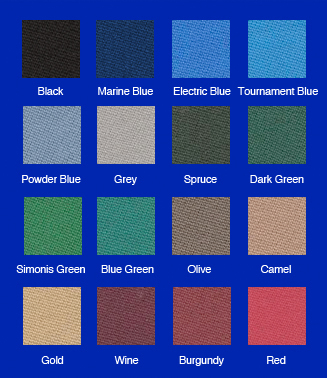 Why choose the Simonis Tournament Blue color? 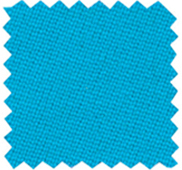 The most favored consumer color preference universally is blue. As a shade of the sky, the sea, and one of the colors of the flag, blue symbolizes security. Higher energies such as communication and creativity are enhanced under blue light. Word associations with blue: calm, tranquil, constancy, patience, and perseverance. Personality descriptors relating to blue: dignified, poised, rational, relaxed, and balanced. Tournament Blue Simonis 860 is now available. Let your league operator, bar owner and favorite poolhall owner know.